Looking for an inverter welder to help you finish the creative work? 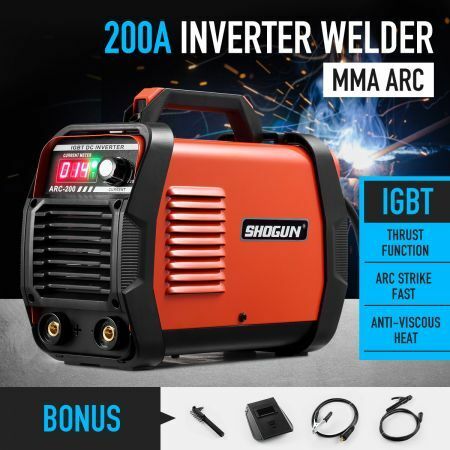 Then you should check this New SHOGUN 200Amp MMA/ARC Inverter Welder, if you are the people who search a welder that will last a long time or a beginner who don't know what kind of welder to look for. 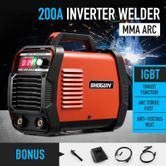 Featuring The Latest IGBT DC Inverter Technology, the welding machine offers a stable current and keep it work continuously with a long time. This welding machine enables running a 3.2mm rod with good forming. And the efficiency is up to 85%, which guarantees you can weld more rods at one time. With thrust function inside, you'll get a smooth and continuous weld finish even though you're new one. And it has An Automatic Protection Function from over-current, over-voltage and over-heating to ensure you could finish your work without worry. This product will meet the most welding needs with this affordable price. Item as described Well packed Swift delivery 100 recommended 5 Star Seller. It has bin working very good I can weld really thin metal Im happy.